“Do I really need poles for snowshoeing?” Many people ask that question before they even hit the winter trail. It makes sense, though. Folks want everything in their first snowshoeing trip to be as secure and comfortable as possible. Anyhow, the answer is it completely depends on you. For the most part, snowshoeing requires no poles but bringing a good pair of them can give you a few benefits. First off, poles significantly improve your stability. Although your snowshoe may have provide you with large base and ample traction to stay sure-footed, the fact that you need to widen your gaits when snowshoeing will still put you at risk of tumbling down. Poles easily solve this problem. Furthermore, when you’re snowshoeing, especially with a loaded backpack, your knees and back are under bigger pressure. By holding on poles, you can distribute the pressure better throughout your body, leading to better comfort and minimizing risk of injury. Sounds good? 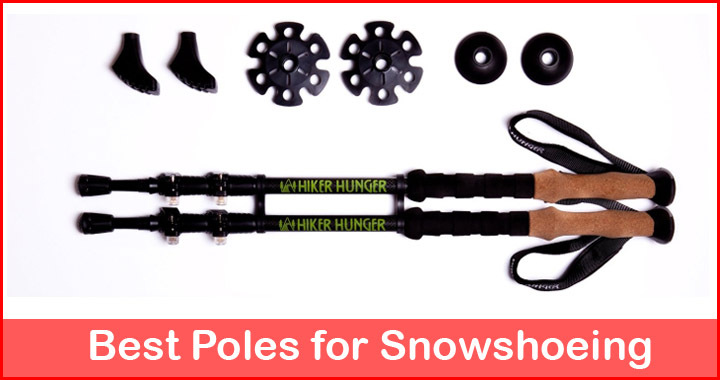 Well, here are are our top 5 picks for the best poles for snowshoeing. 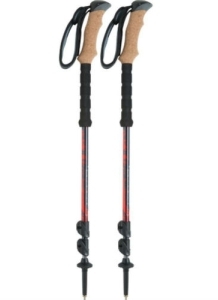 Note that if you already have a good pair of trekking poles, you don’t need to buy a new one. Just get the suitable powder baskets for your sticks, so they won’t sink when you drive them in loose snow. Most of them are only sold for less than 10 bucks. Otherwise, get one of the sticks above. They all come with both trekking and powder baskets, so you can use them year-round. Also, we exclude any ski poles from the list because they generally offer little value for money (unless you ski too). The majority of them are straight shaft with fixed length, which makes them hard to pack. Needless to say, they can’t be adjusted too, should the terrain demands shorter or longer poles. Besides, none of them comes with trekking baskets. 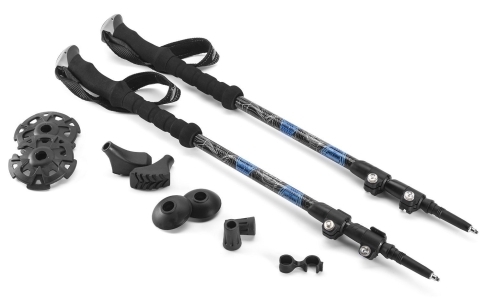 Black Diamond Alpine Ergo is one of those innovative hybrid trekking poles that incorporate both aluminum and carbon fiber in its construction. The upper shaft is made of durable aluminum while the lower two sections are pure carbon. It’s not the lightest poles but not necessarily heavy too. In terms of features, it lacks not a single thing to make it the best trekking poles. The grips are made of cork and angled ergonomically to optimize comfort. Swappable baskets ensure a full all year-round application. Lever lock mechanism can be engaged and disengaged in a matter of seconds. We do wish that the lock is made of metal though, instead of plastic. If you can’t afford the Alpine Ergo, the best alternative is the Trail Ergo still by Black Diamond. Unlike the former, it’s entirely built of aluminum, which allows for more cost-effective manufacturing. It’s not necessarily inferior though. In fact, for winter setting, aluminum shafts are more preferable considering you can’t tell if there’s a rock under the snow and you may hit it with the expensive yet brittle carbon stick. With aluminum poles, the worst case might just leave you with a major bend, instead of crack or even breakage. That won’t render the poles useless and you can still fix it too. Like the Alpine Ergo, this pole also comes with powder basket, so you can use it for snowshoeing right out of the box. How do you like quality poles sold for low price? Hiker Hunger is a tiny company compared to Black Diamond but they mean business. Their trekking poles, in particular, aren’t made poorly. It sports an all carbon construction, which is incredibly lightweight (less than 1-pound for the two of them). Now the thing with carbon poles is they’re stiffer and won’t bend if you put some weight on them. However, they’re prone to breaking. 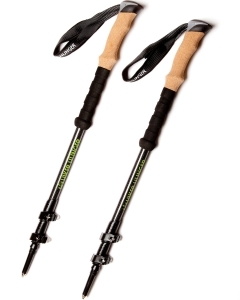 That aside, Hiker Hunger trekking poles sound almost too good to be true. For such a low price tag, you get telescoping carbon poles with lever locks as well as ergonomic and comfortable cork grips. Even more, it comes with a bunch of free accessories including powder baskets for snowshoeing. Another good affordable option for trekking poles is Cascade Mountain Tech Carbon Fiber poles. All the features are almost similar to the previous poles by Hiker Hunger, except the grip. It uses quick flick lever locks, comes with adjustable telescoping design, offers free accessories including powder baskets, and is very lightweight. The grips, however, are made of EVA foam, instead of cork. While it does wick sweat and moisture, it may not be able to absorb impact as well as cork grip does. Moreover, since it’s all carbon, you may want to be a bit more careful as to where you drive the poles in. Getting a little reckless with it and you might end up with major breakage. 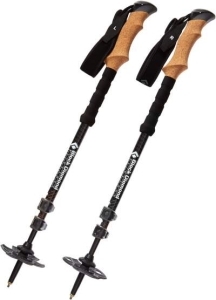 The lowest priced trekking poles in this list are BAFX Trekking Poles. As with all inexpensive gears, all seems to be very basic in this one. The shafts are all aluminum and weigh about 1.55 pounds for the two of them. It uses twist lock mechanism instead of quick release lever, so adjusting the height may be a bit of hassle. Still, it does secure the lower shaft in place. The grips are claimed to be ergonomics but you can bet it won’t be as comfortable as the other poles that make this list, given that they’re made of rubber. It does come with quite a few accessories, though, including the mud baskets. They’re large enough to be used on soft snow to keep the sticks from sinking. Telescoping Design: You will want your snowshoe poles to have a telescoping design, instead of folding mechanism. They’ll allow you to adjust the height to suit the terrain conditions. Lever Lock Mechanism: Poles with lever lock mechanism have many benefits over those with twist lock. They’re easier to adjust and more secure. Aluminum Shafts or Hybrid: Given that the trails are in more harsh conditions during winter, it’s best to go with aluminum poles. They’re heavier but longer-lasting, as opposed to carbon fiber poles. If you have the money, you may also opt for the hybrid models that feature both aluminum and carbon shafts. Interchangeable Baskets: You will want poles that allow for basket swap so you can use them all year-round. Some trekking poles come with powder baskets, so you don’t need to make a separate purchase. Who doesn’t like cheap stuff? Everybody loves cheap stuff, right? Unfortunately, the thing with cheap stuff is oftentimes they come with poor quality, sometimes to the point of being completely not worth it. The same goes with snowshoe poles. They might set you back at much lower price but you may have to deal with lots of inconvenience such as uncomfortable handle, abrasive wrist straps, brittle shafts, frail locking mechanism, and many more. Now, don’t get it wrong. We’re not saying you must invest over 100 bucks in poles, but if you want poles that can last a number of years, you need to be realistic. You can’t expect $20 poles to last more than two years, unless you rarely go for outing. Either way, it’s your call. Just be sure you make the right decision. Don’t have any snowshoe yet? Make sure you check out our best snowshoes review of 2017 before making a purchase.